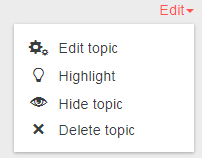 In Moodle 3.1 it is not possible to delete a while section/topic rather than having to delete everything inside it first! It’s also worth mentioning that if you delete a section by mistake, it’s possible to restore it back into the course using the recycle bin! If you’ve not heard of the recycle bin, check out our guide. N.B. For you, it may say Delete topic if this is the course format you are using. More on course formats can be found on our webpage. N.B. Please note that it is not possible to get rid of section 0. this is the top section/topic where the announcements forum is generally located by default. We would recommend that this section is kept as clutter free as possible.